When using Firefox, you end up having lots of tabs open for a quick overview of all the important websites. But this can slow down the start-up and cause problems as all the tabs load simultaneously. Having lots of tabs open when working can cause your browser to slow down, especially when you restart it. 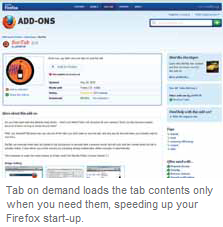 It will take a lot of time to restore all your tabs; this is where the free Bar Tab add-on for Firefox will come in handy. You can download the add-on from https://addons.mozilla.org/en-us/ﬁrefox/addon/bartab. Once you install it, you can put all the tabs that you require frequently in here. And when the browser is restarted, BarTab will not load these tabs automatically,but only when you speciﬁ cally visit them. It will show you the status for each tab, you can load the ones that you need and unload the rest. Furthermore, you have the option to specify which tabs should be loaded and which should never be loaded at the start.